Lakhi ras-barasano barsano kotina brahmananda lajay. Temporary worldly happiness is of 3 kinds: sattvic, rajas, tamas. These relate to the three qualities of Maya. Rajas happiness is much better than tamas happiness, and satvik happiness is much better than rajas happiness. Satvik happiness relates to happiness of swarga, the celestial abodes. You all think about swarga with great respect. A Hindu will say when his father dies, that his father has received swargavas, in other words he is now residing in swarga (heaven). The happiness of the celestial abodes is millions of times greater than the happiness of this earth, but it is still destructible, temporary, material, limited and mixed with sorrow. But, as the saying goes, something is better than nothing. Despite these flaws, it is considered that the greatest material happiness is in swarga. The second best form of material happiness is experienced by human beings on this earth. The third best is the happiness experienced by animals, birds, and insects. A person may wonder, “Do animals experience happiness?” Definitely. A cow finds a little green grass to eat today. As a result, she feels happy and thinks she is having a wonderful meal. Similarly, a poor man eats dry bread every day. Today he went to a feast and there he found fried breads, vegetable dishes, and sweets. He said, “Oh, I really enjoyed myself!” A rich man eats this kind of food every day, so it’s not special for him. There is no difference in the quality of happiness experienced by all living beings. Just as we get great happiness from the things we consider best, so all other life forms experience the most happiness from what they consider best. When celestial beings see what makes us happy they think, “How dirty!” The human form is such that it excretes waste from every pore, and waste is constantly excreted from its nine orifices. On the other hand, a celestial body is constantly exuding a fragrance and it doesn’t excrete waste of any kind. So when the celestial gods look towards us, they make a face and say, “How dirty!” But we make a similar face when we see pigs reveling in filth and say “What disgusting creatures!” But what is our actual condition? Whenever we see ourselves in a mirror we feel joy. But what is stored inside your body? If you were able to take out everything in your intestinal track you would run away. So all life forms experience their own kinds of happiness and suffering. Similarly, the indescribable, unlimited divine happiness or ananda of the divine world is also of three kinds. These are brahm-ananda, paramatma-ananda, and prem-ananda. The lowest of these is brahm-ananda. This relates to the impersonal, formless aspect of God which manifests only as a divine existence. It doesn’t have any form, name or qualities and it performs no actions or leelas. Naturally, if it has no form then what actions could it perform? This aspect of God is worshiped by gyanis or followers of the path of gyan. They refer to God as brahm. Still, this experience of bliss is absolutely unlimited. The one who attains brahm is forever free from Maya. A greater experience of bliss is paramatma-ananda. 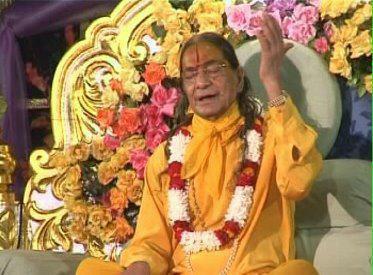 Here God has a form, name, and qualities, but He does not perform leelas or divine actions. Beyond this is the bliss of prem or divine love. This aspect of God is referred to as Bhagavan. This is Shri Krishna. He has a name, form, qualities, abode, leelas and eternal associates. He performs unlimited blissful leelas. This is the bliss of divine Barsana referred to in this pad kirtan. This is why it is said that if uncountable blisses of brahm were gathered together, collectively they still would not equal even one drop of divine love bliss. Even so, it’s important to remember that brahm-ananda is still related to Shri Krishna and that it is absolutely unlimited. Similarly, there is an enormous difference between the bliss of impersonal brahm and the bliss of Shri Krishna (divine love), although they actually are not two. Impersonal brahm does not manifest attributes such as a name, form, or any qualities, yet they are all present. For example, a piece of grain has been kept in someone’s house for years. A visitor picks it up and says, “In this seed there is bread.” The homeowner may think his visitor is crazy for saying this. To prove it, he puts the piece of grain in the ground and waters it. It receives sunlight and fresh air, and a little fertilizer. It will almost immediately begin to sprout and grow. From one grain, a hundred other grains are formed, which can all be ground to make bread. All these things are inside a seed, but in a subtle, unmanifest form, just as the baby in the mother’s womb was not yet manifest externally. Similarly, all of God’s powers are present in impersonal brahm, but in a seed-like unmanifest form. The bliss of impersonal brahm could be compared to the happiness that the mother felt for her unborn child. This is why this line of the kirtan says that uncountable blisses of brahm feel insignificant before divine love bliss.